With just one day remaining in the 2016 election cycle, it’s now possible to tally up the last two years of campaign spending reports and get a near-final look at what the Clinton and Trump campaigns have spent. The chart below shows their totals, in comparison to presidential candidates from past elections. The super PAC spending numbers shown here include only single-candidate super PACs, those that explicitly support a specific candidate. Not included are spending by unaffiliated super PACs and other independent expenditures for or against the general election candidates (often on behalf of a primary election opponent from the same party). In early 2015, this election had all the makings of a record shattering spending race. The field included Jeb Bush, Chris Christie, Hillary Clinton and a host of other candidates with a proven track record of fundraising. Fresh off the 2012 Citizens United decision, the prospect of unlimited spending by super PACs loomed large (the Koch brothers alone intended to spend nearly $900 million in the 2016 campaign). And the historical trend was pointing in one direction. In each of the last four presidential elections, the two general election candidates spent significantly more than in the election before. Surprisingly (or maybe not surprising at all considering both candidates’ record-low approval ratings), Donald Trump and Hillary Clinton have spent substantially less than Obama and Romney did in 2012. To make the comparison to prior years apples-to-apples, it’s not enough to account for inflation only. Not only has the value of a dollar changed over time, but the population has grown (more potential donors) and so has the average household income (more money to donate). When you adjust for all three factors — inflation, population growth and income growth — here is how the numbers shake out (exact calculation described further down). By this measure, spending in this election was a big drop-off from the recent upward trend. But in historical terms, 2016 looks pretty average. It will be interesting to look back a few elections from now and see how 2016 looks in hindsight. 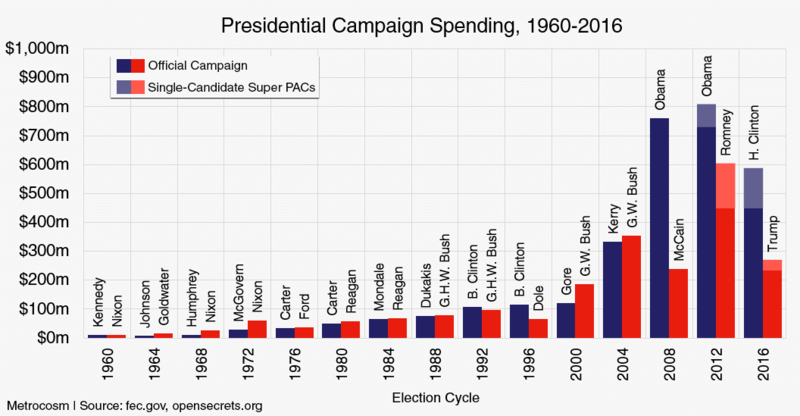 Will 2016 turn out to be a blip in an otherwise ever-increasing trend of campaign spending? Or were 2008 and 2012 the aberration, and is 2016 just a return to long-term normality? Another obvious takeaway is the connection between the amount of money spent and who wins the election. Not since Ford lost to Carter in 1976 has the candidate who spent the most money lost. If past trends are indicative of future performance, Clinton would have the edge. So far in this election, past trends have meant very little. We’ll see very soon whether this one holds up. Historical campaign spending data is from the Federal Election Committee, New York Magazine and OpenSecrets.org. For 2016 figures, official campaign spending is as of 19-Oct-2016 and super PAC spending is as of 4-Nov-2016. The numbers shown do not include spending by political parties or independent expenditures other than single-candidate super PACs. Download the data used in this post. Yes. An interesting comparison is he and Goldwater. They were both Republican renegades, disliked by their own parties. Goldwater managed to raise a lot of money but was smashed in the election. Trump was the opposite — couldn’t raise much money, but managed to win. I’m skeptical about how good a president he will make, but I have to give him credit for pulling off the victory. Maybe I will add a chart showing what each candidate spent per vote. plus he is a racist, All Hail Trump! In constant dollars, would be great. And how much each candidate spent per vote as a percentage of the amount spent per vote for both candidates. Max, I see only a blue-side trend toward more spending of late (looking at the normalized chart). Romney ’12, when compared to Obama ’12, looks to be like the pull-up on McGovern ’72 in response to the anomalous Nixon ’72. What’s interesting is how one might put a value on media support by recalibrating the numbers. Observe the Goldwater/Nixon numbers and election results. Keep in mind Goldwater and Nixon were not exactly media darlings. 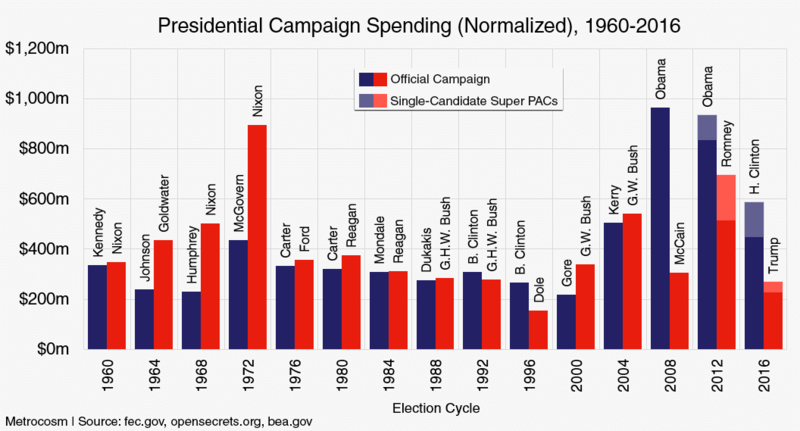 So, apparently, this chart gives us a feel for how much more you had to spend than the other guy to run against the media’s choice back in the day. No doubt media is a huge factor not accounted for here. Those two guys had a negative public image to overcome, as did Hillary,. But Obama was the opposite, very positive media attention and big fundraising. Wonder if there is some connection. Another factor not fully accounted for here is super PAC money. Trump-dedicated super PACs didn’t raise very much, but as a whole GOP super PACs (unaffiliated or for other GOP candidates) raised way more than Democrat super PACs. The same was true in 2012. Is this graph on older results? For example it says Hillary raised 969.1 million on that link not including super pacs. Campaign finance is so crazy. The biggest difference is the numbers here are do not include the money spent by the RNC / DNC, not all of which goes toward the presidential race. Also I only included Super PACs that explicitly supported one of the candidates. But as explained below the chart, it’s ambiguous and there are other ways the super PACs could be counted. Would need to look closer to see if there is anything else. I hear you. It is just odd they all claim the data is from the FEC. The Bloomberg link does show the unspent donations. However there is a pretty big disparity.